Within the Center for Geologic Storage of CO2 GSCO2, NORSAR is leading the microseismic theme, which was just recently conducting a large sized rock sample test, performed by TerraTek. In this test, pore pressures were increased through dedicated drill holes in the sample, with some offset to a diagonal saw cut through the sample. The hypothesis of the experiment was to increase the pore pressure by fluid injections of varying viscosity and hence observe focused slippage along parts of the artificially created fracture plane. Depending on the extend of the pressure plume, such slippage was purely stress-induced or accompanied by pressure increases at the fracture plane. To identify slip and creep along the saw cut, a manifold of acoustic emission sensors was installed at all sides of the 1m3 Castlegate sandstone to observe this slippage and to characterize it size and slippage behavior. The test was successfully conducted and all data will now be processed, analyzed and interpreted with the aim to improve the understanding of processes where low-pressure fluid injection interacts with induced seismicity. As such, thousands of acoustic emissions recorded during the test will need to be analyzed. The GSCO2 is one of the U.S. Department of Energy funded Energy Frontiers Research Centers, where NORSAR has been a partner over the last three years. 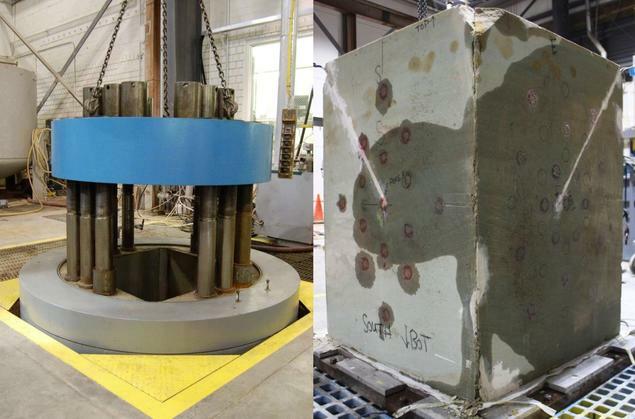 Experimental setup for the large block test and the rock sample after the test has been performed.